← Finding Low-Cost Places to Live in the U.S. I was considering the possibility of becoming an expatriate (“expat”) — that is, of moving outside the U.S. to live cheaply. I wanted to make an informed decision on whether to do it and, if so, where I should start. This post describes some of my investigations of those questions. My own situation was that of a person approaching retirement age. It seemed, though, that most of the following analysis could be useful to people of any age. Persons not interested in a low-cost lifestyle might be interested, instead, in something like the Forbes 400’s Cost of Living Extremely Well Index. This long post contains many technical details. Those will probably be of interest mostly to people who want to do their own calculations, or to those who have an interest in a particular data source (e.g., Numbeo). Most readers will get the general idea by reading the Summary, perhaps taking a look at a few of the colorful graphs, and scanning the list of cities at the end. I wanted to find low-cost places to live abroad. Unfortunately, I found that commonly cited data sources disagreed, sometimes greatly, on the cost of living (CL) in various cities. To reduce the uncertainty and minimize errors, I tried to determine which sources were more reliable, and used multiple sources when possible. Thus I arrived at two different methods. One was comprised of the median of values produced by four data sources (i.e., Numbeo, Expatistan, ACI OR, and UBS) whose results seemed relatively consistent with the focus on low-cost living. I used the median because I had observed that such sources — most notably Numbeo, which typically contributed to any comparison twice as many city evaluations as any of its three peers — could offer values that seemed wildly mistaken. The median could at least reduce the magnitude of such stray data points, and sometimes could avoid errors altogether. The other method used a combination of the World Bank’s ICP country-level CL values and ERI’s city-level values within each country. All of these sources, in both of those two approaches, offered index values or percentages. To convert them to dollar terms, I used values provided by the Living Wage Calculator at MIT (MIT LWC), as discussed in more detail in another post. MIT LWC offered statements of the amounts needed for a minimal lifestyle in thousands of cities and counties throughout the United States. Those U.S. values were relevant to the international context because the U.S. was one of the countries referenced or indexed in each of the two approaches just described. That is, if I had an average value for the U.S., or for a certain city in the U.S., I could use those references or index values to calculate the implicit CL, in dollar terms, in a given location elsewhere. In many cases, the two approaches produced results that were too dissimilar from one another — as if they were calculating two entirely different things. In other cases, however, the results were fairly similar. The results were more likely to be similar when I ignored expensive cities and focused on the lower-cost places that would be more interesting to a budget-conscious expat. The list of cities in the Conclusion is limited to those low-cost cities for which both of the foregoing approaches reached relatively similar valuations. Note that some sources revise their values regularly, and of course currency exchange rates fluctuate constantly. Values quoted here are subject to change. 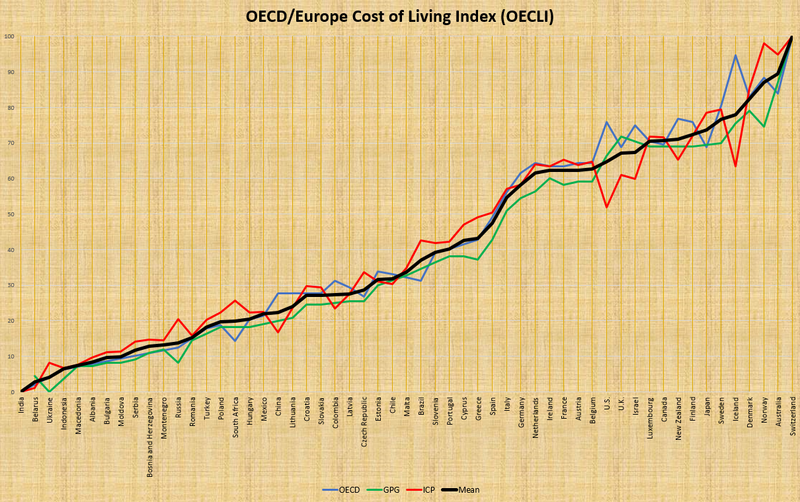 Mercer, the Cexpat, and the Oxpat: Whose Cost of Living (CL)? Reconciling Two-Step & Direct City-Level CL Estimates in the U.S.
My searching led to a seemingly endless supply of webpages telling me which countries were best or cheapest. While I found those sources informative, their discrepancies told me that there was not necessarily any solid agreement on how much it might cost to live in various places. Under the circumstances, it seemed advisable to figure out which sources were most reliable. Some of these websites evidently offered nothing more than the author’s personal opinion. Others — including writers at major news outlets (e.g., Money) — drew upon well-known sources, but did so in confused and potentially misleading ways. Still others cited their own data sources. Eventually I came to understand that a few sources were especially popular. Yet even those underlying sources were not always in agreement. I realized there would be limits to how much information I could glean from even the best data sources. Asking someone how much it costs to live somewhere is a great way to waste time. The answer obviously depends upon a person’s tastes, inclinations, and resources. Yet there were ways to narrow down the scope of the answer somewhat. This Part One introduces data sources (e.g., Numbeo) and related technical topics (e.g., indexes and rankings). Part Two distinguishes the more reliable data sources from the less reliable ones. 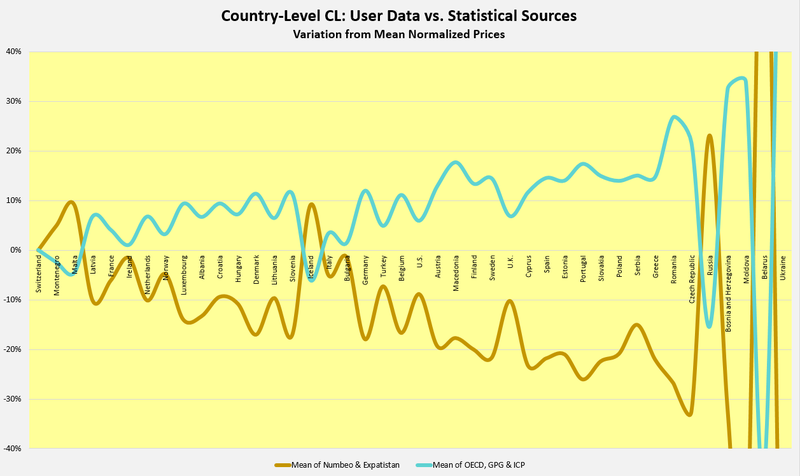 In searching for good data, the first challenge was to find sources offering cost-of-living (CL) data worldwide, so as to facilitate comparisons across nations and continents. I did not have a prior commitment to any one city or country; therefore, I wanted to be able to compare across multiple locations in a wide variety of places. The Grocery and Restaurant indices seemed unnecessary: the description of the CLI made clear that it already included estimates of those expenditures. The LPPI was intended to capture local purchasing power in terms of average local wages. This would probably not be useful to expats who did not intend to work in the target country, or who would be working there at a wage or salary set by international or U.S. standards. I did not think the combined CLI + Rent index was either useful or accurate: my calculations indicated that it was a simplistic figure allocating 48% of total monthly expense to rent, at all locations worldwide (i.e., CLI+R = (48% x RI) + (52% x CLI)). Rent would be a bigger part of one’s budget in some places than in others, and 48% seemed unrealistically high for the average renter, even if rent included utilities. No doubt the Basket of Goods and Services approach would be useful for some purposes, but experience suggested that the amounts people actually spent often exceeded the amounts that, logically, they should be spending, if their estimates of rent and food and other items added up. I did not think Numbeo was going to be very helpful for purposes of an item-by-item approach in any case, given that Numbeo’s cost indices depended upon a small set of just 48 good and services. But even if I had been wrong about that, I was not going to prepare customized expense estimates for hundreds of cities. To add to the last of those several bullet points, a basket of 48 goods and services might be grossly insufficient to assemble a complete monthly budget, piece by piece; but 48 items — or really, even a single item — might be enough to support an accurate CLI. You would just need to conduct, or find, research demonstrating that the price of that single item, or that basket of items, was closely correlated with total average monthly expenditures. For instance, some researcher might be able to prove that, for some reason, the average cost of a family’s weekend restaurant dinner was almost always equal to 1% of their total average monthly expenditures on everything combined. I did not find research like that, and therefore could not advocate a CLI built on just a handful of items. As far as I could tell, having more items in the sample basket would usually reduce a CLI’s chances of being grossly incorrect for depending too much on mistaken assumptions about a few items that, in reality, people would buy in the wrong quantities or at the wrong prices. In short, the most useful parts of Numbeo appeared to be the CLI and the Rent Index (RI). I would have to decide whether to use both of those and, if so, in what combination. I would be getting into that later. For now, it might help to review what an index does. In all of its indices, Numbeo set New York City (NYC) equal to 100. Its lowest-ranked city, Thiruvananthapuram, India, had a CLI score of about 20. This meant that, according to Numbeo’s data, living in NYC was about five times as expensive as living in that city in India. Such values would not give you the actual dollar cost. In addition to its indices, Numbeo also offered a ranking. A ranking tended to be less informative than an index. Consider, for instance, an exam. A ranking would tell you which students did better, and which ones did worse. But it would not tell you how much better or worse. Getting the second-best score would give you a second-place ranking, regardless of whether your score was 50 or 99. Hence, the index value (i.e., the test score, in the range of zero to 100) would be worth knowing. In Numbeo’s case, there were 484 cities, ranked from 1 (most expensive) to 484. Those 484 cities were not evenly distributed in terms of expense. For instance, Greensboro NC was about halfway between Numbeo’s lowest and highest index value. But Greenboro was not halfway up the ranking list, at slot no. 242 (i.e., half of 484). Instead, Greensboro was ranked as no. 72, much closer to the top. That’s because, as portrayed in this graph, there were a lot more poor cities than rich ones in this world, specifically in Numbeo’s list. (Graphs in this post can be enlarged with a click). This graph suggested that, according to Numbeo, the world’s cities might be divided into three general groups. At the right, there was a small set of cities that were not only expensive, but dramatically different from one another in terms of expense. Going from the city ranked no. 30 (Boston, CLI = 89.40) to top-ranked Hamilton, Bermuda (CLI = 141.84) meant increasing your estimated monthly expense by nearly 60%. In the center of the graph, especially between the cities ranked approximately 50 and 280, there was a much smaller drop in living expense for each additional step down the ladder. These seemed, roughly speaking, to be the cities of the world’s middle class, ranging in price from Chicago down to Madrid. Finally, at the left side of the graph, we had the places where costs (and often, no doubt, standards) of living declined more precipitously. Cities in India predominated at the bottom end. As the Wall Street Journal said from behind its paywall, “Useful cost-of-living data don’t come cheap.” That was certainly true of the information offered for sale by London’s Economist magazine through its Intelligence Unit. 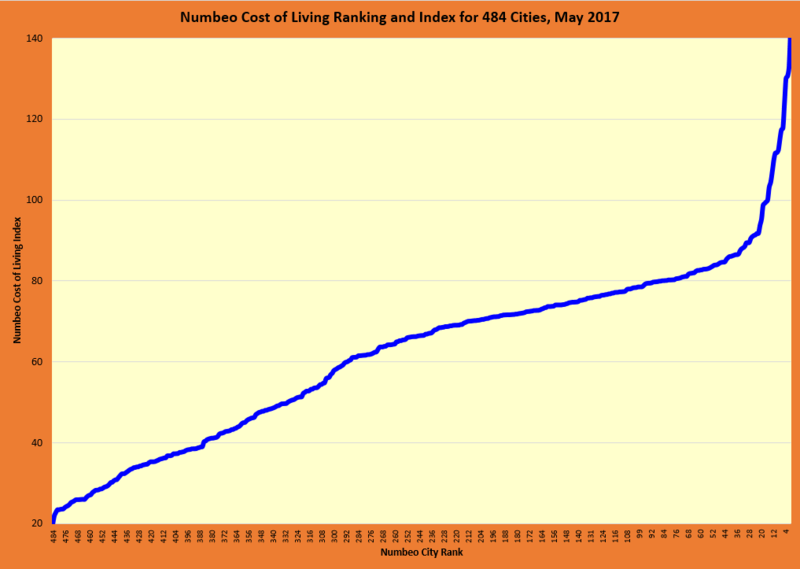 It appeared that up-to-date access to the detailed information in EIU’s Worldwide Cost of Living Report [WCOL] 2017 would entail substantial expense (e.g., $7,600 for 30 days’ access to compare up to 10 cities. EIU reported having “100 full-time country experts and economists, based in offices around the world.” Looking at the biographical information on a few of those analysts at random, I saw that one had a master’s degree in macroeconomic policy and financial markets, and another had a master’s in international political economy, with previous experience as a specialist in international economic monitoring. EIU reported that its data came from a semiannual survey on the prices of 167 goods and services, a considerable step up from Numbeo’s 48. The persons filling out the survey were of a different sort, too: not random individuals who may or may not be collecting data from supermarkets in a consistent manner, but rather corporate executives (e.g., HR directors, heads of research, CFOs). EIU indicated that it grouped those 167 items into 13 categories (e.g., groceries, utilities, transportation), and that EIU did not include rent expense in the calculation of its price index. As shown in that excerpt from the full list, EIU (like Numbeo) set NYC = 100. That seems to be why the blue dots representing the previous year’s data — for the cities shown here, and also for most of the other non-U.S. cities on the list — are located well to the right. It seems that NYC (actually, all American cities) became more expensive during the year: a rise in the U.S. dollar (USD), between 2014 and 2015, meant that you could buy more with your money in Europe than in the U.S. The rise in USD made these other cities relatively less expensive in 2015 than they had been in 2014. That observation suggested a couple of thoughts. One was that what goes up can come down. Consider, for instance, the Swiss franc (CHF). According to OFX, on September 1, 2014, $1 bought 0.918 CHF. One year later, on September 1, 2015, $1 bought 0.966 CHF. So, yes, the value of the Swiss franc dropped during that year, relative to the U.S. dollar (USD), and that’s why Zurich became less expensive relative to NYC. That trend has continued: on May 1, 2017, $1 bought 0.995 CHF. So, great — at this time, your American savings or pension would go far in Switzerland. But let us look a little further back. OFX reports that, as of 2017, the dollar was still climbing out of a pit — that, at yearend 2011, in the wake of the Great Recession, it bought only 0.886 CHF. As another reference point, contrast that against the dollar’s value at yearend 2000, when $1 bought 1.689 CHF. Americans who retired to Switzerland in the early 2000s were able to buy 70% more than they can buy today. If they based their Swiss retirement plans on what they were able to buy then, some of them may have been in trouble in 2011, when suddenly their dollars went only half as far. It’s one thing to compare the dollar against the mighty Swiss franc. It’s quite another to compare the dollar against the currency of a developing nation. For instance, you could buy 9.46 Mexican pesos with your dollar in 2000, versus 19.88 pesos to the dollar today. The peso has been losing value against the dollar. That doesn’t necessarily mean you can buy more goods and services in Mexico now than you could in 2000; it may just mean that Mexicans, paid in pesos, can afford to buy less: their currency’s value has been inflated, which means it has lost purchasing power. Probably both are true, to some extent. And yet, even in Mexico, some retirees may have run into problems in 2011, when the dollar dropped 8% from the previous year. The situation could be much worse in the future. Imagine you are in China, ten years from now, and another economic shock hits the U.S. dollar. That could be really problematic, because maybe by that time the dollar will have dropped a great deal against the Chinese yuan. It’s not implausible: the dollar has been weakening against the yuan since at least 2004. In this scenario, you might have been able to afford a great lifestyle in China in 2017, but by 2027 your dollars might barely cover the basics. The pattern of the Swiss franc is approximately repeated with the Australian dollar: USD has still not recovered from its 2011 low against AUD, and even now can buy only two-thirds the AUD it could buy in 2001. Likewise with the Thai baht (THB): the dollar is now able to buy only 79% as many THB as in 2001. A person could suspect that, over the long haul, rising global prosperity is increasingly independent of the American economy — that, in other words, the dollar may swing higher and lower, but over time it is trending south. Maybe what really kills you is not the grand, slow sway of currency values at yearend: maybe it is the abrupt shock on some random day in June, when suddenly your dollars fall through the floor because hackers have crippled the electric grid in the U.S., and there’s no telling when the country and its currency will be back on their feet, if ever. Doom and gloom are not the only possible responses. One could argue that — in the case of THB, for example — the early 2000s were a fluke, and we should consider a longer horizon. As of early 2017, the dollar was stronger against THB than it was in the years before 1998. Maybe USD would continue to be something of a gold standard, a safe haven, among world currencies. From this sunnier perspective, the message may be, not that you should live in fear of the worst, but just that you may want to have plans against currency contingencies. Whose Cost of Living (CL)? Mercer, a subsidiary of Marsh & McLennan, boasted of having more than 20,000 employees in 43 countries. Mercer’s annual Cost of Living Survey (2016) ranked 209 cities in terms of the prices of “more than 200 items in each location,” again using NYC as the point of comparison. Beyond that, Mercer did not provide much detail on its survey methodology. I did not understand why these various sources used NYC as the point of reference. One problem was ambiguity. To some (e.g., Wikipedia), “New York City” meant the five boroughs comprising the city of New York, while others interpreted it as meaning solely the island borough of Manhattan. In addition, the water surrounding Manhattan served as a natural barrier to the free flow of goods, services, and people, fostering price distortions for some things, notably real estate. There was often no single “New York City” price for things: there was the price range in Manhattan, and then the very different prices in the rest of the city, or in the entire metropolitan statistical area (MSA). Hence, in the sources using NYC as their point of reference, it was not necessarily clear what they meant. Real estate prices in Manhattan were also subject to great fluctuation — after stock market downturns, for example, as I had personally experienced, and also in the wake of experiences like the terrorist strike of September 11, 2001. Rather than make people guess, or try to figure out, whether a price quote occurred before or after some such event, it seemed more sensible to design a CLI around a more continuous and stable real estate market somewhere else — Chicago, perhaps — with more of a typical American price range and fewer extreme high prices. At any rate, Mercer said, “Mercer’s widely recognized survey is one of the world’s most comprehensive, and is designed to help multinational companies and governments determine compensation strategies for their expatriate employees.” This was similar to the focus of EIU (above): “The [EIU] Worldwide Cost of Living survey enables human resources line managers and expatriate executives to compare the cost of living in over 130 cities in nearly 90 countries and calculate fair compensation policies for relocating employees.” These were just two among many companies in the business of making calculations related to employee relocation. The mission, for these people, was to help the expat employee to recreate his/her home life in the target country, to the extent possible. That approach had its critics. For instance, the BBC (McDonald, 2017; see also Bay, 2017) criticized EIU’s decision to name Singapore as the world’s most expensive city. Citing the ACI CLI (below), McDonald pointed out that most Singapore residents don’t attempt the “pretentious” lifestyle accommodated by EIU’s calculations, with “imported cheese, filet mignon,” and so forth, in a city of plentiful, good, inexpensive food. McDonald said that EIU included the cost of buying a car, even though a car was an extravagant liability in a city-state with such excellent and inexpensive mass transit. Such artificial standards could make even a low-cost foreign destination more expensive than staying home. In contrast to the expat employee, there were people who tried, or needed, to live like locals. First, there were the locals themselves, making money in the local currency and spending that currency to buy things. These people might be interested in something like Numbeo’s LPPI (above). And then there were ordinary expats, varying in their positioning between the extremes of the expat employee (living a westernized lifestyle in the target country) and the average citizen (living a local lifestyle). To differing degrees, the ordinary expat might prefer, or at least be willing, to buy local things and observe local ways — getting around on a motor scooter, for instance, or grabbing lunch from a pushcart vendor — in order to save money and/or to experience a real life in the target place. Of course, the present post was oriented toward this latter situation — toward the budget-conscious ordinary expat (sometimes referred to here as the “Oxpat”), not toward the wealthy expat or the corporate expat (the “Cexpat”; pronounce it as you wish). In other words, the effort here was to identify the real cost of living, for the Oxpat’s probably less-than-complete immersion into the local culture. While the foregoing sources seemed to attract the most attention online, there may have been many others capable of providing useful information for purposes of estimating the Oxpat’s CL in various cities worldwide. This section introduces the other sources I found. ECA (short for Employment Conditions Abroad) International provided relevant data services, with a cost of living division offering semiannual CL analyes for 461 locations worldwide. The price for accessing ECA’s cost-of-living data seemed to be available only via discussion with a sales agent. Wikipedia said ECA’s CL calculations excluded rent, utilities, and other items that corporate employers would usually compensate separately. That is, ECA’s focus appeared to be primarily upon expenses that the Cexpat would have to meet from his/her CL allowance. For my purposes, the only free information available from ECA was its list of what it considered the world’s 20 most expensive cities, along with lists from 2015 of the 30 most expensive cities worldwide and the 63 most expensive locations in the Asia-Pacific region. To make use of the material supplied by ECA, I had to choose between their two inconsistent rankings of the most expensive cities in 2015. I used the webpage that would give me a larger total number of ranked cities, yielding a total of 80. Wikipedia said that Xpatulator, like Mercer and ECA, was a primary source of information on Cexpat CL. Xpatulator offered CL information on a total of 780 locations, spread across most of the world’s countries. They said their calculations were geared toward different “baskets” of expenses for different types of needs, ranging among “individuals and small to medium sized organisations” as distinct from larger corporations. Xpatulator offered, among other things, an annual subscription ($89) for unlimited access to data pertaining to a specific location, such as one’s home location. The free Xpatulator offerings were limited to lists of the ten most expensive cities and countries for expats, over the past several years, plus non-numerical CL reviews (e.g., “very expensive” rather than a score of 95) for many locations. These sources seemed too vague and skimpy to bother with. Moreover, I noticed some grounds for questioning Xpatulator’s method. For instance, two of Xpatulator’s ten most expensive cities in 2016 did not even appear among ECA’s top 20 for that year, and the eight others appeared in decidedly scrambled order. Four of EIU’s ten most expensive cities in 2017 did not appear in that Xpatulator list. Separately, I noticed that Xpatulator was close to Numbeo and Expatistan for a number of cities — which, given almost no hard information on Xpatulator’s expert credentials or methodology, raised the question of whether Xpatulator might be just tweaking and selling others’ data. International Living offered an Annual Global Retirement Index, but they seemed to use a bait-and-switch: when I entered my email address as requested, they didn’t send me that Index. Instead, they sent me a list of Top 10 Retirement Havens that I had already seen, and put me on the list to receive unwanted daily emails from them. An ad on the same webpage seemed to say that their index might only consider 24 countries. I continued to pursue the index. This led to a long webpage that seemed to say I could get the 2017 Global Retirement Index by spending $49 on a subscription to International Living. I couldn’t blame them for using the Index to woo subscribers. I think they handled it poorly, though. That wild goose chase and the spam email were just irritating, and their approach suggested a scam mentality. Another source, XpatInsider, offered a cost-of-living calculator with both paid and free versions. The difference was that the paid version ($7.50) included a salary analysis report. The free version, as it turned out, used Numbeo data in a nice spreadsheet format. The FAQs for the Eardex Earth Index indicated that its index was based on 47 items for which users could enter prices, as with Numbeo (above). Eardex required me to register and log in before I could access its data — only to see that Eardex had few if any actual prices in its database, across the cities I checked, on three different continents, and that many of not most of its data points were years old. In any case, there did not seem to be a way to download Eardex data for multiple cities. Expatistan offered a CLI Index ranking 214 cities. The methodology page explained that this was another index based on user-entered prices for an unspecified basket of goods, organized into six categories (i.e., Food, Housing, Clothes, Transportation, Health, Entertainment). That reference to Health was confusing, insofar as the FAQs page stated that education and healthcare costs were not included because it was difficult to get good comparative data on relevant costs (due to e.g., governmental or employer subsidies). Expatistan was based in Prague, and used Prague as its base city (i.e., Prague CLI = 100). The FAQs page stated that the Expatistan database contained about 2 million prices. I did not see a Numbeo-style explanation of whether price entries would eventually age out. UBS (formerly Union Bank of Switzerland, merged with some others) assembled rankings of 71 world cities in terms of prices and wage levels (pp. 8-9). UBS estimated average prices by using a “reference basket of 122 goods and services” representing “the monthly consumption habits of a three-person European family.” Refreshingly, the full UBS report (pp. 17-30) was relatively open about its calculations and their limitations. The report made clear that UBS was proceeding, consistent with the other corporate sources (above), on the assumption that, in any location, this European family would consume items and quantities typical of a European lifestyle (e.g., clothing expense based in part on the price of a business suit purchased in a large department store; an iPhone; residence in a newly built apartment). UBS acknowledged that this assumption, presumably made for the sake of consistency among cities, and for usefulness for a primarily executive clientele, might not capture the reality of, for instance, an Asian family that consumed less meat and dairy. Giap et al. (2015), of the Asia Competitiveness Institute (ACI) at the National University of Singapore, offered a CL contrast for Cexpats and locals (i.e., “ordinary residents”), covering 165 products and services in ten consumption categories (e.g., clothing, health) in 103 cities worldwide (p. 30). Another PDF (p. 27) indicated that data for the resulting ACI CLI Index were drawn from numerous sources, including EIU, UBS, World Bank, International Monetary Fund (IMF), and International Labour Organization (ILO). Giap et al. thus alerted me to several of those sources. Unfortunately, I did not find relevant items from the IMF or the ILO. In the process of groping around, I did find large and complex theoretical books and articles, as well as links to several database links that did not work. No doubt Giap et al. were referring to something specific and useful; I just wasn’t sure what it was. The U.S. Department of State provided a list of city-by-city allowances whose purpose was to allow its employees to maintain their standard of living abroad. The State Department also issued quarterly indexes of CL abroad, from 2003 to the present. The index for January 2017 (p. 1) said that (in each year, apparently), the quarterly reports for April, July and October contained only updated values; the January issue was the one with a full list of relevant countries throughout the world. These quarterly publications provided a U.S. Government index for government employees and a Local index that “excludes special advantages that may be available only to U.S. Government employees.” Users of these quarterly reports were cautioned that they “should not be used to compare living costs of Americans in the United States with the living costs of foreign nationals living in their own country, since the indexes reflect only the expenditure pattern and living costs of American families.” The January 2017 report (pp. 10, 13) also said that CL allowances were available only where CL (excluding housing and education) was at least 3% higher than in the Washington DC area, and explained that values were calculated using a Retail Price Schedule comparing the prices of about 130 goods and services. Given the clear orientation toward expensive cities, and toward a Cexpat rather than Oxpat lifestyle, I did not plan to use these State Department sources. The U.S. Department of Defense (DoD) Overseas Cost of Living Allowance (OCOLA) was likewise based on a philosophy similar to that of other Cexpat indices: “Overseas COLA is intended to equalize purchasing power so that Service members can purchase the same level of goods and services overseas as they could if they were stationed in CONUS” (i.e., the continental United States). Unlike the State Department’s CL data (above), OCOLA data appeared to be calculated for all locations — and there were many locations, including small cities as well as large ones. DoD said that OCOLA was calculated with the aid of two surveys. I saw that those surveys asked about the prices of items that might be unnecessary and/or easily substituted with much cheaper goods or services in some cultures or locations (e.g., strawberries, broccoli, pineapples, microwave oven, washing machine, Blu-Ray player, car oil change). OCOLA listed only places deemed more expensive than the U.S. — which seemed to include most of the world, given the attempt to reconstruct an American lifestyle abroad. DoD OCOLA did not appear likely to be helpful for purposes of this post. The Economic Research Institute (a/k/a ERI or SalaryExpert) provided a CL calculator and a CL lookup tool, both of which evidently drew on ERI’s database of more than 10,000 cities worldwide. Another post provides further information on ERI. I used ERI extensively in that post’s analysis of CLIs focused on cities within the United States. ERI was the only source prominent in that post that also offered information on cities outside the U.S. It was not presently clear whether strengths and weaknesses of ERI data discussed in that other post, within the U.S., would also apply to ERI data for international locations. For cities abroad, ERI offered only an indication of the city’s CL relative to the average within that nation. To use this data in international comparisons, it would apparently be necessary to combine the ERI value for the city with one of the country-by-country sources discussed in the following section. Note that these ERI values were available only via lookup, one city at a time, not through download of an entire list. Altogether, the city-level sources that I could use gave me one or more CL values for a total of 741 cities worldwide. Some cities were evaluated by only one or two of these sources; others were evaluated by all, or nearly all, of these sources. I would be getting into that in more detail in Part Two (below). The preceding section discusses sources of CL data on the level of the city. There were also country-level CL data sources. ExpatInsider offered the InterNations Survey (2016). The results of this survey covered about one-third of the world’s countries. The results seemed to say more about the feelings of expats, in the area of money, than about the actual affordability of the countries surveyed. It did not appear that the survey sought and obtained representative (i.e., randomized) samples of expats — as distinct from, say, handing out questionnaires to some people at a bar, whose financial condition might be very different from that of most expats in that country. Numbeo offered country-level price indices for 121 countries. These came in the same forms as Numbeo’s city price indices: a CLI, a Rent Index, a CLI + Rent Index, specialized Groceries and Restaurant indices, and a Local Purchasing Power Index. Expatistan offered a country-level CLI for 83 countries. Expatistan said that, just as its city values were based on Prague = 100, these country values were based on the Czech Republic = 100. WageIndicator.org seemed to offer information about CL and living wages (i.e., minimal amounts needed to live without public or other outside assistance) worldwide. Unfortunately, there appeared to be some problems with the site. For methodology, the Wages in Context page vaguely referred me back to the main page. Eventually I did find a Codebook (Guzi et al., 2016) providing some details on the project, and took their offer (on that page) to request a copy of their database. Their reply, in full: “Sheets with all data are not for free, sorry!” Another page suggested that there could be a fee of up to €15,000 for such information. WageIndicator’s main page spoke of “Living Wage Calculations for 62 countries.” That was the number of countries examined in its 2013 conference document. But the Codebook said the CL survey was now offered in 82 countries and 46 languages (and that, inconsistently, the Cost of Living app was available for 89 countries). The Codebook said that, in the first quarter of 2016, the survey collected 71,240 item prices (on a total of 75 listed items) from 75 countries, with a few items generating more than 2,000 responses altogether. Another link led to its Cost of Living Survey page, which said that the user could “find your results each quater” (sic) at, again, the main page, where no such results appeared. The CL survey page also said, “0 stored surveys.” It said, “Please be patient while data is loading,” but no data loaded. I was able to get to a survey asking for input on prices of many items by using its “Select country and language” button, but still found no data on results. Based on other work by Guzi et al., and on an interview with WageIndicator’s director, it appeared that WageIndicator’s living wage numbers were based to some extent on Numbeo data. I would explore WageIndicator in further detail (below). Novartis Group evidently conducted an occasional living wage survey in about 80 countries. The company did not respond to my request for further information. Finally, I found that the World Bank’s International Comparison Program (ICP) research was done in “rounds” or “comparison cycles” occurring every six years. The most recent one was in 2011, and its data were apparently published in 2014. The 2017 round was apparently getting underway; it seemed its data would not be available until perhaps 2020. The 2011 ICP results were available in a spreadsheet stating, among other things, a price level index for each country, using the world average as the base (Tables R1 et seq.) and detailing the values of the major components of that index (e.g., clothing, health) (Tables D1 et seq.). According to Deaton and Heston (2010, p. 5), the ICP index incorporated the prices of more than 1,000 different consumption items. For all of these sources, city- as well as country-level, I realized that the data did not all hail from the same year, and that a lot could change in a year. Given ideal data, obviously I would prefer consistency in such matters. This was not going to be an exact science. Things would continue to change year by year. It seemed I would have to do the best I could with what was available. Part One preliminarily examined a number of sources of free information relevant to CL comparisons of cities and countries around the world. Part Two takes a closer look at those sources, to identify, analyze, and build upon those sources that appear most relevant to the challenge of finding low-cost cities abroad. Part One indicated that the sources of free information most likely to be useful for CL comparisons of cities internationally would be Numbeo, EIU, Mercer, ECA, Expatistan, UBS, ACI (Cexpat and Ordinary Resident), and ERI. (I would examine DoD OCOLA separately, below.) The next question was whether any of these eight sources (nine lists) seemed especially useful, or not very useful. The first step was to equalize these eight sources. (The other post elaborates a bit further on normalization and other technical concepts used in this post.) The basic idea was that one could not directly compare a city’s positions on two different rankings. Being listed as the 7th city on a list of 25 cities would not mean the same as being listed 7th on a list of 183 cities. Equalizing would convert a rank or index value to a single standard, typically an index on a scale from zero to 100, and then direct comparison would be appropriate. (Note that the numbers would run in opposite directions: being in first place would typically mean a normalized index score of 100, and coming in last would mean a normalized score of zero.) Some of these eight sources provided index values; some provided rank values; some provided both. I normalized the best information provided by each source: index values, if they provided those, or otherwise rank values. I examined all cities that had been evaluated by at least three of the seven sources, excluding ERI, whose data were not provided in an internationally comparable form. A total of 591 cities had been evaluated by at least one of these sources, but only 155 of those 591 had been evaluated by at least three sources. Of these 155 cities, Mercer had evaluated 144. For 65 (45%) of those 144, Mercer’s evaluation had produced the highest normalized value of any of the seven sources. In other words, each source estimated the relative CL in each of these cities, and almost half of Mercer’s estimates were higher than anyone else’s. ECA was right behind, with the highest estimate of any source for 21 (44%) of the 48 cities evaluated by ECA. Those two sources really stood out in this regard. The next closest percentage was for Expatistan: 16 (only 13%) of its 128 ratings were higher than those offered by any other source. Consider Beijing, for example. Mercer and ECA agreed that Beijing was one of the most expensive cities in the world, with normalized rankings of about 96% to 97%. In 2016, Mercer ranked Beijing 10th most expensive, out of 209 cities worldwide. Similarly, in 2015 ECA ranked Beijing 9th out of 250 cities. For both sources, then, Beijing was among the top 4% of cities. This contrasted dramatically against the other sources. The next highest score, by EIU, put Beijing halfway between the world’s cheapest and most expensive cities. Other rankings were lower. Numbeo and Expatistan, for instance, put Beijing at about the 75% mark — less expensive, that is, than about 75% of the world’s cities. It could be hard to know who was right: Mercer and ECA, or these other sources. Further review of these lists of cities seemed to answer that question. Mercer considered Mumbai the 82nd most expensive city in the world, in the range of Seattle and Stockholm. That did not seem likely. Most other sources (and common sense) considered Mumbai one of the world’s least expensive cities. Mercer also suggested that Atlanta was about as expensive as Melbourne, Australia; that Hanoi and Phnom Penh were about as pricey as Pittsburgh; that Sydney and Paris were less expensive than Tianjin and Chicago; and that Adelaide was significantly less expensive than Dallas. As a black-box source offering no transparency or disclosure of sources or methods, Mercer invited concerns that such ratings may have resulted from a capricious or flatly erroneous methodology. Similarly, I observed questionable findings in ECA’s list. Besides being inconsistent with each other as noted above, ECA’s webpages indicated that Port Moresby jumped 36 places (i.e., from 57th to 21st) in ECA’s ranking in just one year, between 2015 and 2016, and was now ranked on a par with New York; that NYC itself jumped from 69th to 29th in that same timeframe; and that Dalian jumped 52 places — along with many other changes of 20+ places in the ranking within a single year. I realized that, as EIU (p. 3) explained, radical changes in commodity prices could greatly affect costs of living in commodity-reliant countries, and that changes in currency exchange rates could also affect the affordability of any city. But I did not think that applied to Dalian and many of the other cities that had so radically changed place in just one year. As with Mercer, it also seemed unlikely that, as ECA claimed, a number of Chinese cities (e.g., Tianjin, Wuhan) were more expensive than cities in Australia that many people seemed to consider among the world’s most expensive (e.g., Sydney, Melbourne). 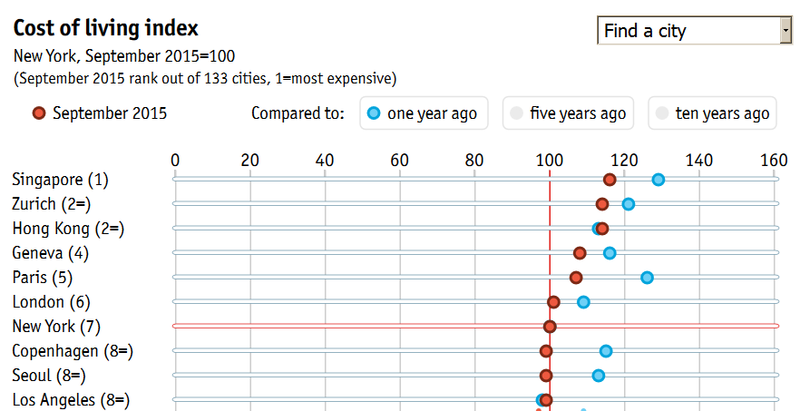 While I was engaged in that sort of critique, I also noticed that EIU offered some implausible conclusions: ranking Hanoi as more expensive than Luxembourg, Dhaka as more expensive than Atlanta, Quito as more expensive than Toronto, Bangkok as more expensive than Boston, and Minneapolis as more expensive than Washington DC. I was sure the EIU people were smart — as noted in the other post, there were quite a few of them, and many had graduate degrees. Intelligence and training were not the issue here. Rather, it seemed that all three of these sources — Mercer, ECA, and EIU — shared a focus on corporate employee compensation that surely made sense from the Cexpat perspective. As explained above, however, this post was oriented toward the situation of the Oxpat. The focus here was not on expense required to recreate a highly westernized lifestyle within the quirks of decidedly non-western markets. By this point, I was disinclined even to consider using UBS — which, as noted above, was also designed with a Cexpat focus. But to my eye, the UBS list did not have the drawbacks I had seen in Mercer, ECA, and EIU; its list generally made sense. UBS listed somewhat more than half as many cities as Expatistan, the next-largest source remaining on my shrinking list. Few of them were in the U.S., which would complicate my planned next steps. I was not sure I could use the UBS CLI in all of the steps I would be taking, but I was reluctant to discard it. The cities on this graph are those for which most of the relevant sources provided values. This graph primarily displays two conflicting tendencies among Cexpat sources. The orange line depicts the mean of the normalized Mercer and ECA values, or Mercer alone where ECA contributed nothing. The green line shows the mean of EIU, UBS, and ACI Expat. I did not attempt to learn about the apparently divergent philosophies or market segments responsible for the sometimes extreme differences between these two groups. Note also the dashed gray line indicating the mean of the values given to these cities by the key Oxpat sources: Numbeo, Expatistan, and ACI Ordinary Resident (referred to henceforth as ACI OR). This line generally echoes the tendencies of the green line, albeit in more exaggerated fashion. To summarize, this section has criticized CL sources oriented toward Cexpat rather than Oxpat priorities. For purposes of this post, there appeared to be no further need for the Mercer and ECA sources. While the EIU, UBS, and ACI Expat sources also seemed Cexpat-oriented, they also departed markedly from the Mercer-ECA path. It appeared they might have something in common with Oxpat sources. If so, I might want to make use of that. In a previous post, I investigated the accuracy of various American CLIs. I certainly knew more about life and expenses in various parts of the U.S. than about anyplace abroad. It made sense to apply tools and methods from that previous post to the present situation, if possible. While there appeared to be no certainty about these things, my tests and explorations in that other post had left me with relatively good confidence in the MIT LWC. There seemed to be a fair supply of data about prices in the U.S., provided by the U.S. government and other institutional sources — and also, for user-driven sources like Numbeo, by some of the many people residing in and traveling to, from, and around the U.S. Therefore, I believed that CL sources claiming knowledge of prices in the U.S. should demonstrate fair consistency with MIT LWC. In using MIT LWC, as with the Numbeo graph (above), I had noticed two somewhat distinct CL realms. At the top end, I found a relatively small number of cities that were highly expensive, with a clear CL pecking order among them. Otherwise, throughout the U.S., I found a large number of cities that were less expensive in absolute terms, and also less different from the next city on the list. Consistent with the low-cost orientation of this post and of that previous post, I decided to focus on cities where, for a single adult with no children, the annual CL for a working adult, estimated by MIT LWC as necessary for a bare-bones life not dependent on public assistance, did not exceed $21,000 per year. Within this example of abstract expressionist art, let me point out several things worth noticing. First, the blue line, running in a relatively smooth path from lower left to upper right, presents LCI (i.e., MIT LWC) values for all U.S. cities evaluated by Numbeo and/or Expatistan. That blue line follows a relatively smooth path because the graph lists these cities in the order of rising CL specified by MIT LWC. Second, notice the dashed black line. That computer-generated line represents the combined trend of the Numbeo, Expatistan, and ERI lines. While not exactly a cause for celebration, the dashed line does hint at grounds for hope, insofar as its general direction is not entirely foreign to that of the blue LCI line. In other words, those three sources, taken together, do vaguely incline toward the message set forth in the LCI path. Third, we encounter the solid black line. This represents the mean of the three sources (i.e., Numbeo, Expatistan, and ERI). The solid black line corrects the oversimplification of the dashed line. This solid black line reminds us that, throughout much of the graph, the three sources tend to go flying off in their own directions, evincing at best a limited sympathy with what LCI is trying to do. The viewer can believe to some extent that the black line really is trending as the dashed line claims. Fourth, we have the red line depicting the ERI values. While those values may appear somewhat chaotic compared to the more calm and measured progress of the blue LCI line, that would change if the graph were to be reorganized around ERI. As detailed in the other post, ERI did appear to be a relatively accurate source, and that comes through in the contrast between ERI and its more erratic brethren here. Fifth, the brown line for Expatistan. That line is not necessarily more random than the red ERI line; the main Expatistan problem is just that it brought so few data points to the party. This explains the brown line’s occasional long lurch: it is just moving along, among those relatively few cities for which it had CL information. Finally, the green Numbeo line. Numbeo, I am sorry to say, is a cluster. There remain, even here, some hints of progress in the general direction of the dashed black line, but throughout much of the graph Numbeo is lost. Here, again, the other post contains further commentary — noting that, for example, Numbeo considered Minneapolis more expensive than Fort Lauderdale or San Jose, and Wichita far more expensive than Reno. Without Numbeo’s erratic input, the black line representing the mean would be far less volatile. The most likely explanation is that, when the green Numbeo line goes zooming for the stars, that reflects a single data input by some creative person whose sense of a town’s prices is, at best, uninformed. One can surmise, for instance, that Numbeo’s database has not been inundated with inputs from Akron OH — that, in other words, the tall green peak at the upper left corner of this canvas constitutes the artistry of one freethinking individualist in that lovely burg. Larger cities (e.g., Kansas City, Indianapolis, Nashville, Providence) seem to be captured by data points much closer to the dashed trendline, presumably representing an average of more users’ inputs. It would be easier to believe that the problem was with LCI, rather than with these three other sources, if these other sources were all telling the same story. There are places in the graph where, leaving aside the supportive black line, the three do appear to be somewhat in sync. Overall, however, in this graph it does not even appear that any two of the three are particularly consistent with one another. In the other post, I mentioned a suspicion that ERI may draw heavily from another source known as C2ER, whose inputs are supplied by relatively consistent and to some degree identifiable Chamber of Commerce personnel around the country. In other words, this graph may capture some of the contrasts among relatively unstructured if not problematic data collection efforts like those of Numbeo and Expatistan, the potentially greater order underlying ERI’s data, and the highly organized MIT LWC, assembled from large governmental databases that attempt to capture reality with maximal coherence. The other post documents an extensive and painstaking search for the most accurate information on the CL of American cities, for purposes of people seeking a low-cost place to live. LCI — the blue line in this graph — was the result of that search. The red line (ERI) was the closest alternative I found. Compared to the relatively consistent and low-variability nature of LCI, this graph suggests that ERI had potential, Expatistan was sketchy, and Numbeo was only vaguely relevant, for purposes of accurately presenting CL in a substantial number of U.S. cities. The preceding section compared several international city-level data sources, in terms of their accuracy within the U.S. That discussion concluded that ERI produced results most consistent with those of the relatively trusted MIT LWC, Expatistan somewhat less so, and Numbeo least so. I was able to test Numbeo and Expatistan in the U.S. domestic context because — unlike EIU, UBS, and ACI — they reported values for a number of affordable American cities. Now it was time to compare city-level sources internationally. In this context, at first I would consider all cities, not just the affordable ones; therefore, I could also use EIU, UBS, and ACI. 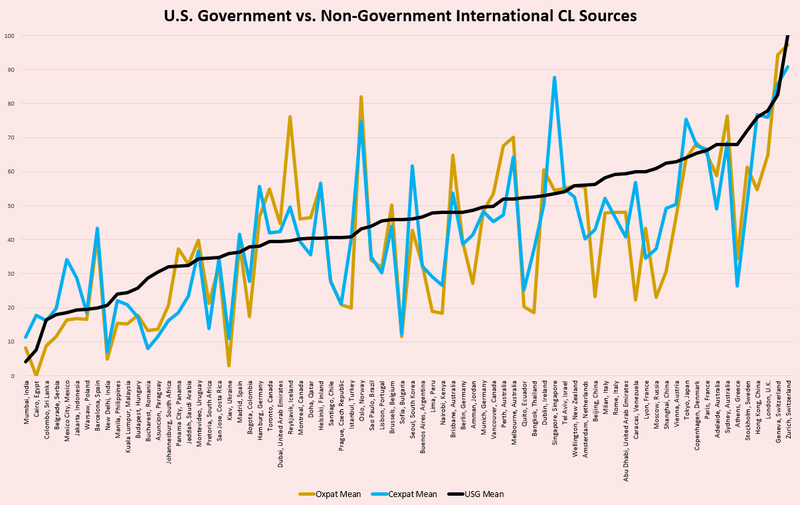 I decided to add, to the mix, the two U.S. government (USG) data sources mentioned above: the U.S. State Department and Department of Defense (DoD). In the State Department data, I chose the Local index, for private contractors who would not have access to special USG discounts. In the DoD COLA, it appeared that the entries given a flat score of 100 reflected only a judgment that no CL adjustment would be made; I disregarded those in favor of “Other” entries with a value greater than 100. (The DoD list contained no values less than 100.) I also found that these two USG lists were surprisingly discontinuous — that is, they did not overlap a great deal. There were 601 cities on the DoD list and 214 on the State Dept. list. Of those 214, only 86 (40%) also appeared on the DoD list. Thus, there were 727 names on the combined list. 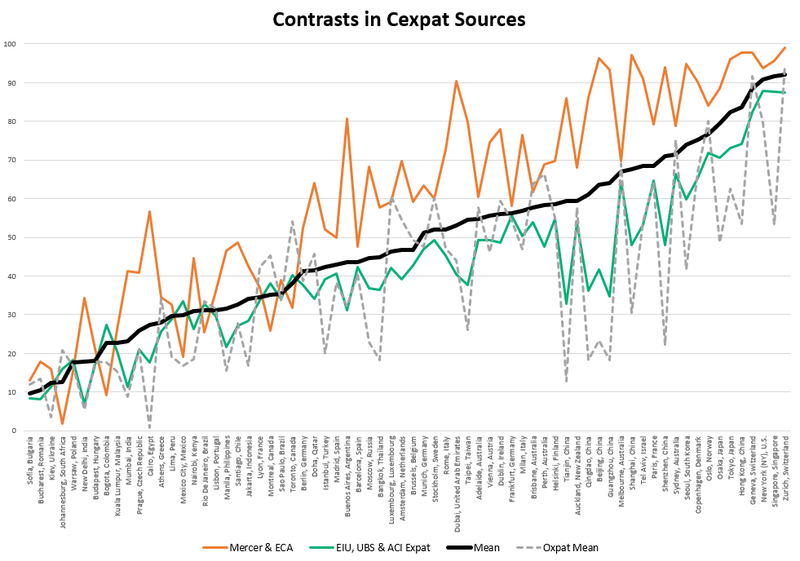 This graph highlighted the contrast between the mean of the USG sources and the means of the Cexpat and Oxpat sources. Cexpat and Oxpat sources were relatively harmonious, here, compared to the trajectory of the USG source mean. It could still appear that all sources were in agreement at the far left and right sides of the graph, but that was just the math of equalization, compelling values to converge toward zero and 100, respectively. Not that things were completely ridiculous between the left and right extremes. There was some logic to the USG mean throughout, with a fair number of lower-cost cities at the left (e.g., Mumbai, Mexico City) and high-cost cities at the right (e.g., Zurich, Sydney). But there was some chaos, too, with Toronto, Reykjavik, and Oslo on the poor side and Caracas, Bangkok, Quito, and Athens on the expensive side. No doubt the USG figures were sensible for their purpose, within the bureaucratic context of USG employee and contractor compensation or reimbursement. But the USG figures did not seem to be intended to track Oxpat or even Cexpat CL with any particular accuracy, and did not in fact do so. At this point, it seemed I had reached the end of this line of inquiry. I wanted CLI values for cities around the world, but good information was scarce. The USG option had not panned out. Unless I could think of any other approach, I was going to be limited to the more credible Cexpat and/or Oxpat city-level sources. In an earlier section of this post, Numbeo, Expatistan, and to a lesser degree ERI did not perform especially well, in the attempt to demonstrate their credibility as alternate sources of CL information on American cities. If that was the situation in the U.S., where data were relatively plentiful, it did not augur well for those sources’ usefulness in other countries. But just in case, I decided to try again, looking this time at CL data for Europe. European house price and other economic statistics vary in quality. It is often a surprise to non-Europeans to discover that swathes of this rich, highly developed continent are not covered by good housing statistics. . . . Northern European countries have generally good house price time-series. . . . German house price statistics are weak. France has very good statistics . . . . There is a particular lack of housing statistics in Italy, Greece, and Turkey . . . . Statistics in Eastern Europe are weak. As for house statistics, so also, evidently, for other CL statistics. As an alternative, that GPG page offered country-level estimates of the cost of $1 worth of U.S. goods, purchased in various European countries, using unspecified calculations based on IMF data. So there was that option: could I get somewhere by pursuing country- rather than city-level data? Eurostat offered a Harmonised Index of Consumer Prices (HICP) for European countries. Wikipedia indicated that HICP was largely similar to the BLS CPI in the U.S. One page said that, in 2015, HICP collected prices on 190 products. HICP’s methodology page, badly in need of an update, said, “In 2007, more than 2.7 million prices were collected for the HICP every month in the 27 EU Member States. Approximately 370 000 outlets are surveyed in more than 2 300 cities or municipalities.” It sounded like the coverage had expanded since then. HICP’s comparative price levels page led to price indexed data for European countries in 2015. Eventually, I found that HICP was very similar to other European sources, especially GPG. To avoid redundancy, the graphs in this section do not depict HICP. I also considered using WageIndicator.org. As noted above, WageIndicator offered country-level CL data worldwide, but the functioning and content of its website had seemed flaky. That initial impression was further supported at this point. A WageIndicator document reporting on a living wages conference (2013, p. 14) incorrectly suggested that the statutory minimum wage in the U.S. was actually greater than the amount needed for a living wage, quite opposite to the findings of MIT LWC. WageIndicator’s Wages in Context page (which, according to its main living wage page, was actually supposed to be its “World Map of Living Wages” page) seemed to update that, suggesting that the living wage for an individual in the U.S. in 2017 ranged from $1,236 to $1,652 per month, or $14,832 to $19,824 annually. But that, too, was inconsistent with MIT LWC, which (as discussed in my other post) ranged from (at least) $16,388 (McAllen, TX) to $30,058 (New York). TradingEconomics.com offered what appeared to be a summary of the most recent WageIndicator data. I could not be confident of that: TradingEconomics offered no explanation, nor did I notice any WageIndicator endorsement of TradingEconomics. The TradingEconomics summary offered (among other things) what appeared to be an estimate of the living wage in each country, priced in the local currency. Using current exchange rates, I converted these apparent WageIndicator data into USD. The results contained some obvious irregularities. El Salvador’s living wage was priced in terms of the Salvadoran Colón, which was eliminated in 2001. The average living wage was said to be $1,890 per month in the U.S., but only $1,128 in Canada. That appeared inconsistent with sources putting the Canadian CL near if not above the U.S. CL (e.g., Globe and Mail, HuffPost, NationMaster). At $1,356, the living wage in Costa Rica was said to be higher than the living wage in Canada or Sweden — as compared to only $172 in neighboring Nicaragua. The apparent WageIndicator values for European countries, normalized, were frequently very different from values shown by any of the sources discussed in the preceding section. In short, WageIndicator did not appear to be a serious contender. Possibly the most famous PPP calculation was The Economist‘s annual calculation of its Big Mac Index, as an indicator of how much a McDonald’s Big Mac hamburger cost in different countries, priced in USD terms. (See also e.g., iPad Index, Sushinomics.) Of course, Big Mac ingredients (e.g., labor, meat) could cost more in one country than another. But the Economist explained that Big Macs could remain unequally priced even after taking such cost variations into account. Of course, the fact that a Big Mac has different prices in different countries does not mean that people in those countries are more or less likely to buy one. According to Antweiler (2016), “One of the key problems [with PPPs] is that people in different countries consume very different sets of goods and services, making it difficult to compare the purchasing power between countries.” But ICP (2014, p. 7) said that a PPP could be calculated, not only for an individual good, but also for any set of goods and services, including one for the entire set of things that people normally buy — or, in ICP-speak, “Actual Individual Consumption” (AIC). Theoretically, the Economist said, “in the long run [currency] exchange rates should move towards the rate that would equalise the prices of an identical basket of goods and services (in this case, a burger) in any two countries.” If the amount was lower than what you would pay in the U.S., that would indicate that, in the long run, prices would want to rise in that other country relative to the U.S. But then, as another British economist advised, “in the long run, we are all dead” — a thought of particular relevance to a potential retiree wondering whether the wave will break before or after s/he does. In other words, as Heston (2010) pointed out, the theoretical price convergence often does not happen in reality, even over a span of decades. Some countries remain cheaper than others, possibly for a very long time. Within the ICP (2014, pp. 9, 86) framework, Actual Individual Consumption (AIC) was just one of the several major aggregates comprising a country’s Gross Domestic Product (GDP). ICP explained that AIC did not include governmental or collective services that may be provided at different levels in different countries (e.g., defense, police, healthcare, education, environmental protection). In other words, AIC was insufficient to measure the true amount spent on an individual’s ordinary life within a given country. Instead, ICP (pp. 85-86) considered an economy expensive or inexpensive according to a price index based on its total GDP. The World Bank’s spreadsheet provided that information in Table R1, column 05 (i.e., Excel column I), titled “Price Level Index (World = 100).” This was the value that I used in my calculations. So now I had country-level price or CL index values from GPG, HICP, OECD, Numbeo, Expatistan, and ICP. Most of these sources covered nations on multiple continents, but I narrowed the inquiry to European countries, as named in the GPG list. That list also included the U.S., and I retained that entry for purposes of comparison. Generally, these sources had entries for a total of 42 European countries, except that HICP was missing data for four, Expatistan was missing data for six, and OECD was missing data for 13. To compare these sources, I equalized their price or CLI values. Since some values were missing from the OECD list, I had to change its formula, to start its normalized results at an appropriate level. To do that, I set its bottom value, for Russia, equal to the mean of the other sources’ values for Russia and two other countries adjacent to Russia on the list, sorted by mean. I made a similar adjustment for HICP, starting at Macedonia. No such adjustment was necessary in the case of Expatistan’s missing countries: its scale began at Ukraine, which other sources likewise considered at or near the bottom of the price rank. I was concerned that mixing price and CL indices might produce distortions that only an economist specializing in this area would recognize and understand (see e.g., Biggeri & Ferrari, 2010; Triplett, 2001). But those distortions, if any, appeared likely to be subtle. It did seem that each source was attempting to arrange the countries in the proper order, from least to most expensive, and to estimate the amount of difference between them. ICP assured me that PPPs were in fact used to calculate poverty rates and price levels, among other things. On that understanding, again lacking any God’s-eye perspective from which to identify true accuracy, I looked for signs that any one of these sources might be relatively credible, or not. My first observation was that, as in the city-level comparison — leaving Expatistan aside for the moment — Numbeo’s normalized country-level values were most likely to depart from the mean of the three other sources’ normalized values. In fact, when compared to its peers, Numbeo’s entries were more than twice as likely to be the most divergent from the mean of all sources; and when Numbeo’s entries were most divergent, they also diverged by much greater amounts than those peers did. Those comparisons may sound a bit abstruse, but the point was simple enough: the data that users entered into Numbeo’s database resulted in values that were relatively inconsistent with values independently calculated by OECD, HICP, IMF, and the World Bank. In light of the similar finding at the city level (above), it seemed Numbeo might be well-advised to impose limits on permissible variations — to cap any user data input departing excessively from trusted alternate sources (e.g., the MIT LWC) until supported by further entries, or perhaps simply to withhold display of information for a city or country until at least several users had entered relevant data. This graph summarizes differences in the normalized price values provided by the various data sources. The averages of the normalized values submitted by Numbeo and Expatistan (N & E) tended to be perhaps 15% below the overall mean; the averages submitted by the other sources were roughly 10% above the overall mean. On the left side, everybody agreed about pricey Switzerland. The last half-dozen countries at the right side were mostly low-cost countries, among which the percentage differences were large but the relative rank was not in serious dispute. For instance, among these five sources, the normalized values for Moldova (ranging from 2.24 to 10.44, with Switzerland = 100) differed greatly in percentage terms, but all sources placed Moldova among the least expensive countries. The primary message of the graph lies between those extremes: N & E mostly priced countries lower than the other sources did. In Portugal, for instance, the mean of the N & E normalized CLI values was about 25, while the other sources averaged 40. N & E essentially said that, even in countries just a few places down from the top of the list (e.g., Denmark), prices were dramatically lower than in Switzerland, while the other sources did not see such a dramatic drop in prices as one moved down the list. It was possible that N & E were right and the other sources were wrong, but the city-level results (above) did not encourage that interpretation. Nor did comparisons among these countries. For instance, according to Numbeo, Denmark was about as expensive as Italy; Sweden was cheaper than Italy and Ireland, and about as expensive as the U.S. (hence, the U.S. was cheaper than Italy); and the U.K. was cheaper than the U.S., and about 25% cheaper than Italy. To the contrary, the three opposing sources generally agreed that Ireland was less expensive, and Italy was much less expensive, than these other countries; that the U.S. and the U.K. were approximately at the same price level; and that Sweden was about 14% more expensive than the U.K. I was inclined to doubt that a potentially small number of N & E users had better data than the World Bank, the OECD, Eurostat, and the IMF; nor did the N & E conclusions agree with general conclusions arising from browsing among sites discussing such topics. For instance, there did not seem to be much support for the claim that Sweden was cheaper than Italy. This graph demonstrates that, except in a few of the most expensive countries, the mean of N & E could be brought much closer to that of the other sources, simply by increasing it by 25%. Without that adjustment, though, it seemed users should be aware that Numbeo and Expatistan seemed to understate European country-level CL by at least 20% on average — more so in some countries and less so in others. A possible explanation of this discrepancy was that the baskets of goods and services that N & E used to compare prices among various cities tended to overstate prices in the most expensive countries. Another possibility was that N & E had old data, not sufficiently updated to account for inflation. The starting question, in this section, was whether Numbeo’s performance at the country level in Europe was such as to reduce concern about its earlier performance at the city level in the U.S. The answer was that N & E appeared to do better when dealing with larger cities, and with countries, where things could average out — where, that is, greater numbers of user data entries could ameliorate the impact of rogue users inserting grossly inaccurate information. Nonetheless, this section suggested that, even at the country level in Europe, Numbeo and Expatistan were more variable and less accurate than ICP, OECD, HICP, and GPG (i.e., IMF). On the country level, then, it seemed advisable to use N & E as secondary rather than primary sources. The search for low-cost cities worldwide had led to N & E, among others; but now, as described in the previous sections, I had concluded that N & E were not especially reliable. Yet as far as I could tell from my (e.g., 1 2) searches, only N & E seemed to include entries for many smaller cities around the world that could be especially appealing as low-price destinations. I didn’t want to lose N & E altogether, if I didn’t have to. Rather than rely naively upon N & E as straightforward sources of city-level CL information, I wondered if there might be a workable alternate strategy. It seemed I might be able to proceed in two steps: first, develop a country-level CLI; then use N & E and/or other sources to estimate city-level CL, within the constraints recommended by the country-level CLI. The question in that case was, how do I develop a country-level CLI? I had found that the DoD cities values were not reliable; it seemed the DoD country values would probably not be reliable either. A quick comparison against ICP confirmed this. DoD considered Canada less expensive than India, and Rwanda and Senegal more expensive than Sweden or Denmark. As with the city values, these country-level judgments may have been correct for DoD’s purposes. But they were not what the Oxpat would likely encounter. As another way of building a country-level CLI, I considered drawing upon the city-level values provided by various sources. It seemed that, if I could get values for a fair number of cities within a country, perhaps I could average those to estimate country-level CL. The problem was that many of the cities evaluated by various city-level sources (above) had been evaluated by only one or two such sources, and it seemed that at least three separate evaluations would be advisable to obtain a relatively stable value. But then, if I required at least three cities to form an impression of a country’s CL, I would be left with only ten countries in my index. The previous section suggested that a country-level CLI might best be built using ICP, OECD, GPG, and HICP. Before exploring that possibility, I took a careful look at HICP. That source was atypical: it generally agreed with the other sources, in terms of countries’ relative rank, but its normalized values were very often the lowest of these four sources. That appeared to be due to a phenomenon noted earlier: possible overstatement of prices in the index country (i.e., Switzerland), distorting the normalized results. HICP indicated that Switzerland was 27% more expensive than the next most expensive country on the list (i.e., Norway). That was possible, but the means of the Oxpat city sources suggested that Oslo was only about 18% behind Zurich, on a par with Lausanne and Bern, and more expensive than Lugano. Similarly, the means of the Cexpat city sources considered Stavanger to be near the top of the list, almost as expensive as Bern and Basel, and more expensive than Zurich and Geneva. I also doubted HICP’s determination that prices in Japan were about the same as those of Italy; HICP’s Japan value was far below the level estimated by the other sources evaluating Japan. Not to overstate the case: I saw that if I eliminated the three or four countries ICP rated as least- and most-expensive, and normalized a moving average of the remaining country values, HICP was quite close to ICP for most countries. Alternately, without that tinkering, HICP was relatively congruent with N & E — but then, I had already decided N & E were not really on target. HICP was not essential: for present purposes, there was only one country (i.e., Kosovo) for which HICP was either the only source or the only alternative to ICP. With that one exception, therefore, I decided not to use HICP as a country-level source. I did reconsider the option of basing country CL evaluations on at least a weighted portion of N & E, with or without HICP, but I decided against that due to the irregularities I had observed previously. In the interests of keeping matters relatively simple and consistent, I decided to exclude those sources except as just noted. This was not to say that N & E, or HICP, were without merit. I recalled that I did not have any deep understanding of ICP’s PPPs and other economic concepts mentioned earlier. These, ultimately, were abstruse measures that would not necessarily relate precisely to the expat’s circumstances. It seemed advisable to stick with ICP, OECD, and GPG for now, so as to construct that worldwide CLI; but it also seemed advisable to keep in mind the question of the expat’s actual CL experience. The task, now, was to arrive at CL values for as many as possible of the 201 countries or territories on my list. (I did not attempt exact conformance with all lists of territories.) From that list, I eliminated 28 for which none of my sources offered a CL-related estimate: Afghanistan, Andorra, Eritrea, Guyana, Kiribati, Liechtenstein, Marshall Islands, Micronesia, Monaco, Nauru, North Korea, Northern Mariana Islands, Palau, Palestine, Papua New Guinea, Samoa, San Marino, Solomon Islands, Somalia, South Sudan, Timor-Leste, Tonga, Turkmenistan, Tuvalu, Uzbekistan, Vanuatu, Vatican, and Western Sahara. That left 173 countries. Of those 173, four (i.e., Argentina, Lebanon, Libya, and Syria) had been evaluated only by Numbeo (and, in the cases of Argentina and Lebanon, by Expatistan as well), and one (i.e., Kosovo) had been evaluated only by HICP. For these five countries, I used the means of the values provided by those sources. The values from the three sources produced the mean values shown by the black line in this graph. There were some relatively notable departures from the mean. At least two of the largest departures, the U.S. and Iceland, had been especially impacted by the Great Recession. It seemed likely, in other words, that for some countries ICP’s 2011 data no longer reflected current conditions. For those countries, and no doubt for others as well, it would probably be better to use non-ICP values. Unfortunately, as just noted, non-ICP values were available for only 55 of the 168 countries evaluated by ICP. In that case, there was the risk of mixing updated values for some countries with non-updated values from other countries, producing a distorted impression of the relative affordability of various countries. I saw, in addition, that most of the departures from the mean appeared in the more expensive countries, which would not be targets of interest for a budget-conscious potential expat. Aside from the expensive countries, it appeared that most countries’ CL values had not changed significantly between 2011 and 2016. In the interests of simplicity and consistency, then, I decided to use ICP as the core of my worldwide country-level CLI. Of the five countries for which ICP, OECD, and GPG were most in disagreement, only the U.S. had much chance of being either a source or a destination of many English-speaking potential expats who might be consulting this post. Hence, I made a manual exception in the case of the U.S., replacing its ICP value (53.77) with the mean of the OECD and GPG values (73.56). Using the normalized ICP values had another advantage: once I had calculated the adjusted values as just described, I could convert them back into the original ICP terms. For example, as just indicated, the revised U.S. index value was 73.56, on the normalized scale of zero to 100. As a practical matter, it was not clear what that meant. But when translated back into Price Level Index (PLI) values like those given in the downloaded spreadsheet, it became possible to speak in terms of dollar values. That 73.56 was equal to a PLI of 163.49 — which was a 27% rise from the PLI of 129 calculated back in 2011. That seemed plausible, given the information that, for example, the dollar bought 26% more euros and 36% more yen at yearend 2016 than at yearend 2011. Let us review. I normalized the ICP values, so as to compare them with the normalized values produced by other CL-related schemes (e.g., OECD, GPG). Those comparisons persuaded me to prefer ICP over those other schemes, with a few additions and adjustments. The most important adjustment was an updated estimate of the U.S. price level. That estimate (ICP PLI = 163.49) told me how expensive life in the U.S. was, on average, on the spectrum from 35.13 (Egypt) to 209.63 (Switzerland). Now, the question was, what could I do with that? As far as I could tell, the average CL in the U.S. was 163.49 on the ICP PLI. That was 4.7 times the CL of Egypt. So if I knew how expensive it was to live in the U.S., on average, I could estimate how expensive it was to live in Egypt. Granted, these were not exact numbers. The ICP PLI value of 163.49 could be incorrect; in fact, it was incorrect every day, as currency values fluctuated. But it was not merely random or crazy. It was an estimate informed by multiple recent sources, bearing some plausibility in comparison against the numbers coming from other countries. It was the best I could find. So for those who did need or want some kind of ballpark figure to work with, it was something. Of course, I could estimate how expensive it was to live in the U.S. The other post examined multiple sources and concluded that MIT LWC seemed to provide the best information on that question. MIT LWC calculated that, in 2016, the average annual U.S. living wage was $65,860 (before taxes) for a household of two working adults and two children (i.e., 2 + 2). That was roughly the amount ($65,807) MIT LWC calculated as the pretax living wage for that 2 + 2 household configuration in Orlando FL. In the other post, I used MIT LWC’s figures for the typical household consisting of one adult with no children. I decided to continue with that scenario here as well. MIT LWC said that a single adult would need $23,945 before taxes in Orlando. Thus, the cost for a single adult was 36.3% of the $65,807 cost for the 2 + 2 household. In an analysis of MIT LWC after-tax figures for 47 U.S. cities ranging from low- to high-cost, I found that, on average, the single adult household cost 36.8% as much as the 2 + 2 household. For present purposes, then, Orlando seemed to be a fair representative of the average American city, in terms of the amounts that a single-adult and also a 2 + 2 household would need, in order to meet minimal expenses. As reported in the other post, MIT LWC calculated that, after taxes, a single adult would need $16,388 per year in McAllen TX. McAllen was commonly cited as one of the least-expensive cities in the U.S. By comparison, MIT LWC reported that a single adult’s after-tax expense in Orlando would be $21,052. These figures suggested that McAllen was 22.2% cheaper than the U.S. average. That was quite close to the 23.7% that Kiplinger estimated as the difference between McAllen and the national average — especially when taking into account that Orlando was slightly below MIT LWC’s nationwide average of $65,860 (above) for the 2 + 2 household. These percentages could also be applied to the ICP values. If McAllen was 22% cheaper than Orlando, and if Orlando was a fair proxy for the U.S. average, then we could ask the ICP this question: what countries are up to 22% cheaper than the U.S.? The summary response — which, again, would vary with fluctuations in currency exchange rates — was that this group tended to consist of countries (especially European countries) that would seem relatively similar to the U.S. — not Scandinavia, for the most part, but the U.K., Germany, France, Belgium, and also Canada, Israel, and at least ten others. So there was the question of whether a person would rather be in McAllen than in, say, the average city in Spain (23% cheaper than the U.S.). Of course, western Europe was not where the real savings were. At the bottom of the list, as mentioned earlier, ICP’s values said, in effect, that Orlando (as a proxy for the U.S. overall) was 4.7 times as expensive as Egypt. So, on average, the figures from MIT LWC suggested that a single adult expat willing to go native could achieve a minimally independent lifestyle in Egypt on $4,479 per year (i.e., $21,052/4.7, or 21.3%). This obviously did not mean that sophisticated consumer electronics, imported liquors, or an SUV ride on an interstate highway would cost only one-fifth as much as in the U.S. For various reasons (e.g., laws, infrastructure), such things could be far more expensive than in the U.S.; they could be absolutely unavailable. We had not gotten into the country-by-country details of ICP’s calculation of its PLI. This was apparently a general-purpose indication of relative CL. It appeared that the degree of hardship experienced by an expat would vary according to location specifics and individual preferences. Outside of that 22% perimeter, we were in the world of countries that (according to ICP) were simply cheaper than anyplace in the U.S. Whether an expat could stand to live in such places, and how much extra s/he would have to pay in order to make them suitably pleasant, were questions that might be best resolved through consultation of materials pertaining to lifestyle. This post could only attempt to estimate CL in such countries. Now, at any rate, I had a set of dollar values estimating the average cost of basic living in affordable countries around the world. It wasn’t quite time to list those countries, though; it seemed there might be more adjustments before I was done. CL Estimates in the U.S. In earlier sections, I had concluded that I might have to rely on city-level Cexpat and/or Oxpat CL sources of varying reliability. I decided to see if country-level sources could lead to an alternative estimate of city-level CL. Having developed a sense of country-level CL, I was now arriving at the final step in this alternate approach. At this point, the weapon of choice was ERI’s CL lookup tool. As indicated above, that tool had the frustrating property of providing CL estimates relative to the specific country, making it useless for direct comparisons among cities internationally. Now that I had country values, however, it appeared that I should be able to use ERI to produce a list of city CL estimates that I could then compare against those offered by the city-level sources. Of the 763 cities identified in Part One (above), for which at least one of the city-level data sources provided a value, I found ERI CL estimates for 668. (Yes, I looked up all those cities, one at a time.) ERI’s remarkable dataset suffered, at this point, from imperfect search and browse features, so I was not able to find values for some cities that may have been in that dataset somewhere. Then I combined ERI’s values for those cities with the country-level estimates reached in the previous section. So, for example, ICP had informed me that Spain was, on average, 22.65% less expensive than the U.S. Given the estimated $21,052 annual cost of a single adult’s minimal lifestyle in the U.S. (above), it appeared that, on average, a minimal-expense year in Spain should cost $16,284 (i.e., 77.35% of $21,052). Now ERI was telling me that some cities in Spain were more expensive than others. Among the Spanish cities for which I found values in ERI, I saw a range from 99.5% of the national average, in Zaragoza, to 129.7% of the national average, Madrid. It seemed that something lower than 99.5% had to be counteracting Madrid’s 129.7% to produce a national average of 100%. It seemed, in other words, that ERI must be including all of Spain (i.e., countryside and small towns as well as big cities) in computing its national average (and likewise in other countries). That was evidently what ICP had done too. So it appeared reasonable to conclude that average annual expense for a single adult in Spain would range from $21,120 (i.e., $16,284 x 129.7%) in Madrid down to $16,202 (i.e., $16,284 x 99.5%) in Zaragoza, and even lower in smaller towns. I made similar calculations for all of those 668 cities for which ERI had given me relative percentages. Now I wanted to compare those results against what I would get from the city-level sources (e.g., Numbeo). As discussed in previous sections of this post, those sources did not seem to reach their values by going through this two-step process of identifying country-level values and then calculating relative city-level adjustments within each country; instead, as far as I could tell, they simply collected data and offered results on various cities. At times, earlier in this post, it had seemed useful to evaluate the most credible of the city-level sources in groups, especially dividing them into the Oxpat (i.e., Numbeo, Expatistan, and ACI OR) and Cexpat (i.e., EIU, ABS, and ACI Expat) groups. At this point, however, with the prospect of ascribing specific dollar values, there was no escaping the fact that these sources often differed substantially with other sources, including even those that were supposedly in the same group or guided by seemingly similar philosophies. Accordingly, I decided to compare these six sources individually against the ICP-ERI results described at the start of this section. I started that comparison by looking again at their values for cities in the U.S. In the previous discussion, I had repeatedly observed some apparent distortion among city-level values at the more expensive end of the scale. I had also acknowledged that “New York” could be a poor choice of index city, given the potential for ambiguity arising from its huge sprawl and multiple definitions. As an alternative, among the four U.S. cities evaluated by all six of these sources, I noticed moderate agreement on the relative priciness of Chicago. Its MIT LWC estimate was that a single adult with no children would need $22,287 after taxes to meet a year’s minimal expenses. That was above the $21,000 cutoff recommended in the other post for the more affordable cities in the U.S., but well below MIT LWC’s $25,376 estimate for the NY MSA. Accordingly, I indexed these cities with Chicago = 100 = $22,287, setting the lower end of the index at whatever city and relative value they considered least among their evaluated U.S. cities. Here the cities are arranged in MIT LWC ascending order, consistent with the impression that MIT LWC was the most factually grounded source of American city CL; hence the black MIT LWC line traces the most consistent ascending path, moving from less to more expensive cities, up to Chicago. This graph offers three other solid lines. Two (for Numbeo and ICP-ERI) are artificially smoothed, to express the general tendency of the underlying dotted lines that present the actual data. The third, orange line represents Expatistan, whose relatively few data points (with filler in between) make for a different kind of artificial smoothness. In the U.S., at least, Expatistan appears to understate CL increasingly as cities grow less expensive. Very roughly speaking, all three of these solid lines agree with MIT LWC’s gradual upward trend. The agreement is especially imperfect in the case of Numbeo’s red line, which (as in the previous analysis) displays only vague consistency with MIT LWC. The correspondence between those two is not bad, however, in one sense: away from the left and right extremes, especially, Numbeo’s values do tend to fluctuate around the MIT LWC trend. The blue-green ICP-ERI line is a different matter. It does run fairly parallel to the MIT LWC line — but at a higher level. And that is puzzling. We started with the impression that Orlando’s CL was approximately average for the U.S. From that average (estimated by MIT LWC as $21,052 per year after tax for a single adult), we used ERI’s city-by-city estimates to tell us how much to add or subtract, in order to capture CL of a particular city. If MIT LWC had the city-by-city values right, then the ICP-ERI line should track it pretty closely. I found that the ICP-ERI line came down to match MIT LWC (at least for the leftwards two-thirds of the list) when I manually set the starting point at $18,300 rather than $21,052. My best explanation for this was that I should have used median rather than average values, and should have chosen that median differently. That is, rather than work back from MIT LWC’s statement about the “average” CL of $65,860 for a 2 + 2 household (above), perhaps I should have sought the median of all values in MIT LWC. Among the city values I had looked up in MIT LWC, the median was $18,903. No doubt that would have dropped if I had looked up more small towns. But with all that, even when I reduced the starting point to $18,300, the right side of the ICP-ERI line would still curl sharply upward, departing more radically from MIT LWC in the territory of the more expensive cities. I guessed that this divergence was due to a divergence in purposes. The concern driving MIT LWC was, how much does it cost to maintain a minimal lifestyle? When you leave the heartland and enter Manhattan, your average one-bedroom apartment no longer offers a view of trees and grass. Instead, at four times the price, you move into a shoebox with a view of a ventilator shaft. If the purpose driving the ICP people was to make more exact comparisons — to state the price of an apartment of the same size, and with a somewhat comparably cheery outlook — then surely their estimated CL in the big city would vary from that offered by MIT LWC, who may have just wanted to know how much the average one-bedroom shoebox cost. If that hypothesis was correct, I was going to choose the MIT LWC approach over the ICP approach, for two reasons. First, MIT LWC was the one with the dollar values. Even if the ICP approach was theoretically better, it would not help me do real-world CL calculations. Second, I would consider the ICP calculation incomplete. Yes, you pay a fortune for almost nothing in NYC. But if you really want to compare apples to apples, your nothing includes access to an enormous variety of forms of entertainment, available in some cases around the clock, and to hordes of people whose company you may find profitable or otherwise desirable. You may not be able to find that in Tulsa. It would be difficult to price that in the residential expense calculation. The central message of the graph seemed to be that, at least for cities below the $21,000 cutoff used in the other post (with the possible exception of a few of the very lowest-priced cities), the values produced by the ICP-ERI two-step procedure were pretty close, on average, to those produced by MIT LWC, provided I applied the ERI city-level modification to a starting figure of $18,300 rather than $21,052. 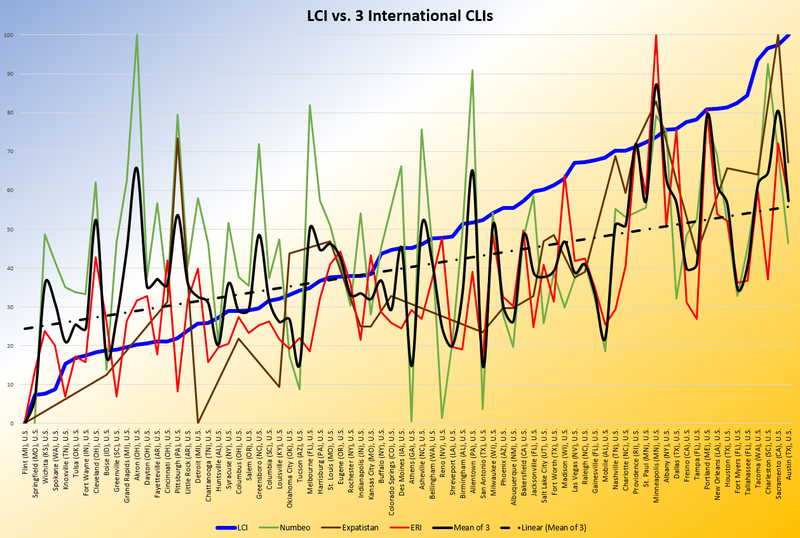 Even with those adjustments and limitations — $18,300 starting point, $21,000 ceiling for MIT LWC single-adult CL — the graph showed several exceptions, some peaks and valleys, where ICP-ERI significantly exceeded MIT LWC. The most notable instances were Mineapolis (exceeding by 19%), Portland ME (11%), and Dallas (10%). I did not have a ready explanation for those particular discrepancies. I did not notice a clear link between such discrepancies and population size, political inclination, or regional location. Aside from those few relatively visible exceptions, it appeared that this exercise had been moderately successful — that it was indeed possible to identify a substantial set of American cities for which MIT LWC and ICP-ERI would point toward roughly similar CL conclusions. 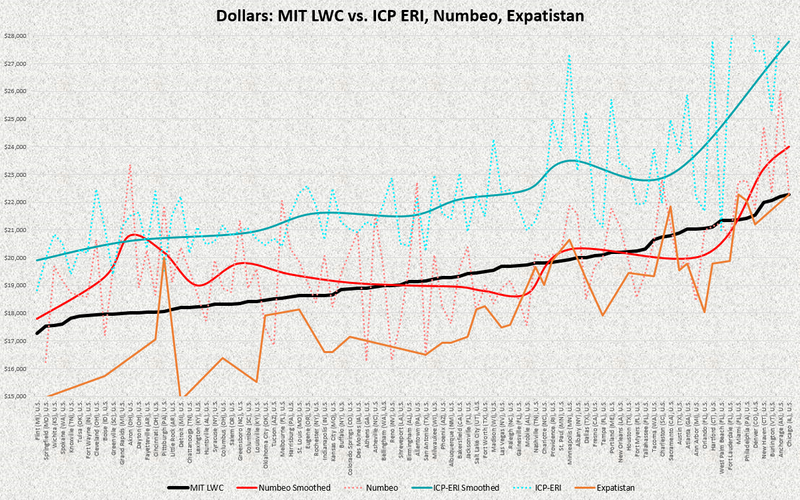 The MIT LWC values were those for a single adult taken directly from the MIT LWC lookup, for cities below $21,000, and the ICP-ERI values were those resulting from a two-step process: (1) find the country-level base value, and then (2) apply the ERI city-level adjustment. The previous section found that MIT LWC and ICP-ERI approaches exhibited considerable CL consensus in less-expensive U.S. cities. The next question was whether a similar approach would work in cities outside the U.S.
To review, the U.S. approach started with $18,300, as the estimated average CL for a minimal lifestyle in a less expensive city in the U.S., for a single adult with no children. To that $18,300, we added percentages provided by ERI, representing ERI’s estimate of a particular city’s variation from the U.S. average. For instance, ERI estimated that Akron OH was 2.2% above the U.S. average, and that meant the single adult’s estimated CL in Akron would be $18,703. That diverged somewhat from MIT LWC’s calculation of $18,007 but, across a set of more than a hundred comparison cities, the divergences were mostly not great, and the positive and negative divergences averaged out. It seemed, in other words, that if one did not have the presumably more accurate MIT LWC values, as would be the case abroad, one could at least approximate those values by using the ICP-ERI alternative. For those 46 cities, I quickly saw that EIU and AC Expat (whose mean is represented by the light gray dotted line in the graph) provided values that were relatively similar to one another (which was not surprising, given AC Expat’s concern with EIU) but quite different from the low-cost focus of this post. For 37 (82%) of these 46 cities, EIU and AC Expat provided the highest CL estimates from any source. As before, it appeared that the Cexpat sources tended not to be helpful for the budget-conscious Oxpat. That said, at least EIU and AC Expat did tend to agree with other sources as to where the peaks and valleys should be. In other words, they might be willing to spend more for the desired lifestyle in a particular place, but they seemed to share at least some agreement on which places were more or less expensive. On that, the two other pairs of sources — Numbeo & Expatistan, and ACI OR & UBS (represented in the graph by the pink and greenish lines) — were often in relatively close agreement. Between those two pairs, the latter (and especially ACI OR, by a ratio of almost 2:1) accounted for 87% of the lowest CL estimates from any source — consistent, again, with ACI’s interest in demonstrating the contrast between Cexpat and local resident CL. As shown by the straight blue dashed line in the graph, the overall trend of those two pairs of sources, taken together, was the familiar path from the lower left to the upper right corner of the graph, moving from less- to more-expensive places within this sub-$21,000 non-U.S. set of cities. The overall average represented by that trend line was actually quite similar to the black ICP-ERI line, at the right side of the graph — among, that is, less-expensive cities in developed (mostly European) nations. But even among those developed cities, these sources often departed by thousands of dollars — that is, by high percentages — from the ICP-ERI estimate. The gap grew even wider on the left side of the graph, among less-developed, mostly Asian nations. Earlier, it had seemed that Orlando might serve as an appropriate starting point for the ICP-ERI calculation, with an estimated $21,052 annual CL for a single adult. And perhaps that (or an even higher starting point) would produce the greatest conformity, for more expensive cities. But for less-expensive cities in the U.S., it had seemed that the better starting point for the ICP-ERI calculation was $18,300. That now seemed to be the case, likewise, for less-expensive cities elsewhere in the developed world (notably western Europe). But at the left side of this graph, it appears that the ICP-ERI calculation is too low. To make it consistent with the trend of (mostly) Oxpat sources in developing nations, the starting point would have to rise again. I found that increasing that starting point by one-third (to $24,400) would make the dashed trend line and the ICP-ERI line nearly identical for cities in the developing world. An even higher starting point would be required for the least expensive cities (in e.g., India). These observations suggested a U-shaped relationship between ICP-ERI and the other Oxpat sources as well as MIT LWC: it seemed they could be made to produce roughly similar results only if the starting point for the ICP-ERI calculation was lower for the cities in the middle (e.g., less-expensive cities in Europe and the U.S.) and higher in the world’s least- and most-expensive cities. That adjustment could be made. 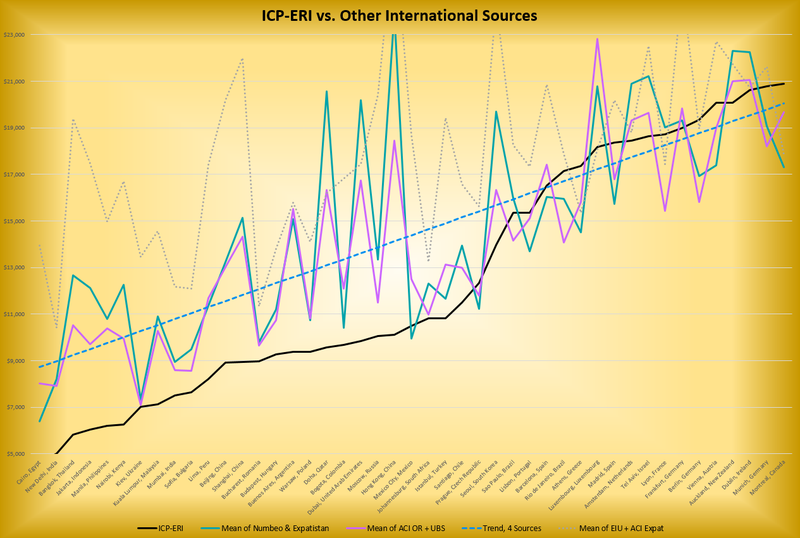 It was not as simple as a straight-line relationship between ICP-ERI and other sources, but it was at least manageable. But there was the additional problem that, trendline aside, the values produced by these other sources simply weren’t very consistent with those produced by ICP-ERI. The trendline did not conceal the fact of a lot of zigging and zagging. ICP-ERI was not turning out to be a good predictor of the CL estimated by these other sources for a given city. This was not really surprising. The ICP-ERI estimation of international city-level CL was a tenuous affair, with multiple links in its chain: it depended upon the estimate of country-level CL (mostly supplied by ICP), the estimate of city-level CL within the country (supplied by ERI), and the extension of MIT LWC to provide dollar values, based on the observed relationship between ICP-ERI and MIT LWC values within the U.S. Any one or more of these elements of the calculation could be in error. Taken together, the errors could be compounded. Of course, it could also be that the other sources were mistaken. That possibility would be more compelling if the other sources disagreed, not only with ICP-ERI, but also with each other. But where the other sources had somewhat divergent purposes and yet did substantially agree at least in direction and also, to varying extents, in magnitude, it seemed unlikely that they were all very mistaken in a substantial number of cases. And yet there was the earlier observation that Numbeo and Expatistan were often dramatically inconsistent with MIT LWC. Given the impression that MIT LWC was more solidly based in data, and that it produced few glaringly implausible results, it was difficult now to say that ICP-ERI must be wrong because several other sources agreed with Numbeo and Expatistan. I did wonder about Numbeo’s claim that Kiev was less expensive than New Delhi, for example, and about ICP-ERI’s determination that Bangkok was cheaper than Mumbai. But these 46 cities did not provide enough of a surface for good traction. I went back to my full list, which at this point consisted of 741 cities worldwide. From that list, I selected all cities that had been evaluated by ICP-ERI and by at least one of these other international sources, excluding EIU and ACI Expat. This comparison of values for 446 cities highlighted at least the extreme cases where ICP-ERI and the median of the other sources (i.e., Numbeo, Expatistan, ACI OR, and UBS) diverged most sharply. I saw that ICP-ERI priced U.S. cities like San Francisco, Boston, and L.A. at levels 50% higher (and more) than the other sources did, and yet ICP-ERI priced indubitably expensive cities abroad (e.g., Reykjavik, Singapore, Dubai) at levels half that of the other sources. Whatever the problems with the other sources, plainly something was wrong with the ICP-ERI approach. It was pretty clear that the ERI city-level adjustments were too small to explain the bulk of those discrepancies. Rather, the ICP country-level adjustments seemed to be in error or, more likely, inappropriate for this purpose for some reason. But not for all countries. I noticed that the two approaches reached very similar results in many places. I derived a list of the countries where the two approaches’ results differed by at least 50%, and compared it against a list of countries where the differences were 10% or less. Cities in China and Italy appeared on both lists. Otherwise, however, these lists, containing cities in 85 nations, were entirely distinct: cities where the two approaches differed by up to 10% were entirely located in OECD/EU nations plus Azerbaijan, Kazakhstan, Namibia, Nigeria, and Venezuela. None of the cities where the approaches differed by 50%+ were located in OECD/EU countries except Belarus, Bulgaria, Iceland, India, and Indonesia. If these other sources (e.g., Numbeo) were accurate, they seemed to say that the ICP values were most reliable where ICP was able to compare its results against those produced by others (e.g., OECD, IMF). I had found it tempting to go with ICP, rather than those other sources, partly because it covered so many countries, but now I could not be confident that its coverage was dependable. That analysis may or may not have been correct. Meanwhile, though, as I reviewed the chain of processes leading to the present situation, I recalled one particularly weak link. Earlier, I had noticed that, on a scale from 0 to 100, from the least- to the most-expensive countries, the U.S. had scored between 42.85 (Numbeo) and 76.81 (OECD). An earlier graph had shown that the country-level value for the U.S. was one of the most visible areas of disagreement between OECD and ICP. I had decided to use a value of 73.56, merely because it was mean of OECD and GPG. 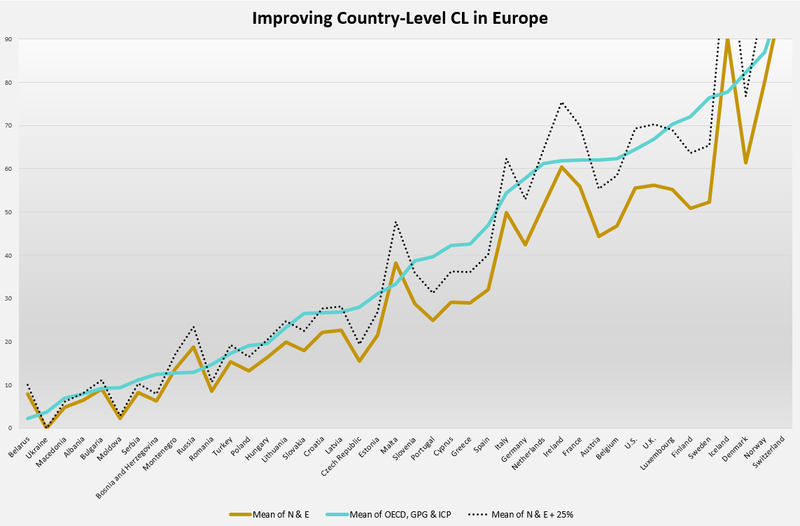 That U.S. value was crucial: it determined how the estimated average U.S. CL was translated into other countries, using the ICP comparative values. So now I began to tinker with that number. I saw that, among the 446 cities worldwide that I had just examined, a value of around 60, give or take 5 — that is, closer to the value that ICP itself (and also N & E) had calculated — tended to minimize the discrepancies between ICP and the four other sources (i.e., N & E, ACI OR, UBS). Homing in on that, I reduced the list of cities, removing (1) those that were in the U.S.; (2) those whose highest estimated CL from the relevant sources (i.e., Numbeo, Expatistan, ACI OR, ICP-ERI) exceeded $21,000; (3) those whose lowest CL estimate exceeded $10,000 and was at least $5,000 below the highest CL estimate; and (4) those whose highest CL estimate from any such source exceeded $15,000 and was more than 150% of the lowest CL estimate. The steps just described gave me a list of 229 lower-cost cities (i.e., up to the $21,000 cutoff) on which the best sources seemed to be in relatively close agreement. The dollar amounts shown here are, for each city, the median of the estimated annual expense values calculated from figures supplied by Numbeo, Expatistan, ACI OR, and/or ICP-ERI. Note that not all four of those sources supplied values for every city. These amounts are calculated on the basis of values supplied by MIT LWC for the cost of a minimal lifestyle for a single adult with no children. My vague sense, from limited exploration of MIT LWC data, was that a second adult might add about 60% to the single-adult cost, the first child might double the single-adult cost, and subsequent children could add 50% each. Again, these are not necessarily the average, lowest, or highest amounts that people actually spend per year in such places. These are estimates based on data sources that claim to provide information relevant to the cost of living (CL) around the world. It would be highly advisable to do further research, and to gain firsthand experience in any such place, in order to learn more about how much it actually costs to live there, and what you might get for your money. This entry was posted in Uncategorized and tagged cheapest, cities, cost of living, countries, Economist Intelligence Unit, ERI, Expatistan, global, international, least expensive, list, Living Wage, Numbeo, worldwide. Bookmark the permalink. Man could you draw a chart of median cost of living vs median disposable income? Mustafa, I think there might be a way. At the moment, unfortunately, I’m engaged in other projects. I’ll make a note of it, but it will probably be quite a while before I get back to this. In the meantime, a search leads to some sources of possible relevance.